The Savannah Visitor Plaza is where visitors without a zoo entrance ticket can linger for as long as they like. The view over Savannah Lake is lovely, as it’s brimming with turtles, and Black Swans glide serenely amongst them. It’s prime real estate, with private islands commandeered by Black Hand Spider Monkeys, and a couple of Lemurs share another. Taronga Western Plains Zoo is the flip side of its sibling in Sydney. Set on the dry Central NSW Plains, there are no harbour views here. I don’t visit the zoo this time round, but I think it’s probably changed a bit since I pedalled the 6km circuit on a rusty old bike in 2001. In 2017, the bikes at the rental shop are all shiny and new, and look a lot more pleasant to ride. If cycling to each animal exhibit is too much like hard work, hire an electric cart, or drive your own car, or walk. Unlike their city slicker cousins, these animals have space – and that’s the beauty of this zoo – space to roam. At the entrance, alongside the ticket office and the Zoo Shop, is Bakhita’s Cafe that has seating that takes in the views towards Savannah Lake. While I queue at the cafeteria-style eatery, I read the blackboard sign that says “fresh scones”. The scones definitely taste like they have been baked on the premises, but probably early this morning. They’re not bad and have luckily been removed from the microwave just in time. The Diary Whip cream (97 per cent fresh cream from a can) is super light, and I’m not even going to mention the sachets of jam! Tea: A basic variety of Sir Thomas J Lipton teabags served in a paper takeaway cup. Overall: A zoo cafe with a zoo view. Yeoval. What? Where? I had never heard of the place until I passed through the tiny town on my way from Wellington to Peak Hill. The Visitor’s Centre/Banjo Patterson Exhibition/café sits on the edge of town, only noticeable by the large wavering bright yellow ‘OPEN’ sign that flags down passersby. But it’s the Devonshire Tea sign that gets me, and maybe the pennyfarthings in the front yard of the former community hall. Yeoval’s claim to fame is Banjo Paterson. Apparently the poet spent the first seven years of his life here. Anyone who has visited Australian country towns, may be inclined to think that old Banjo definitely got around or lived a very long life, considering the number of places ‘claiming’ the poet did ‘something’ in their town. Henry Lawson gets the same. 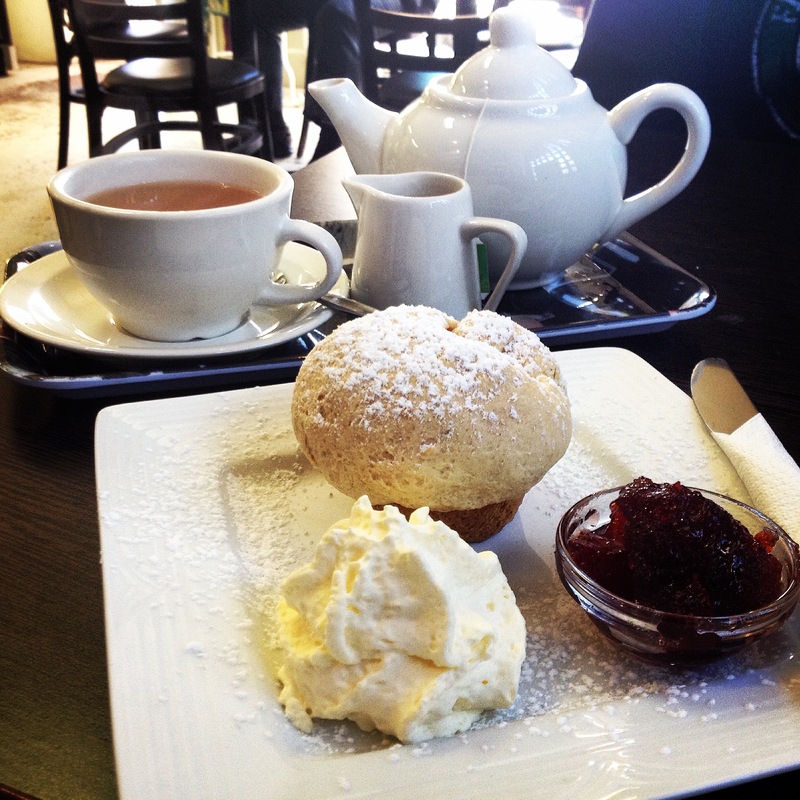 Whatever brings visitors to town is what I say, and for me the scones definitely would. They are lovingly homebaked, light and fluffy with a creamy texture and taste. The cream too is sensational. Real cream whipped thick with an electric beater – how hard is that? Not very, and I wish more places did it. The jam is average, but nice and thick and not syrupy sweet, and the mix works brilliantly. Scone lovers are crazy not to stop for five dollar DTs, and maybe linger to learn a bit more about the illustrious poet. Tea: A large selection of Twining tea bags served in a good-sized pot. Overall: A damn good Devonshire Tea at a bargain price! As far as plant nurseries go, Magnolia Nursery is on the small side. I don’t see any burly men with wheelbarrows carting pot plants and saplings, actually there’s no one working the plants while I’m there. All action is in the cafe with groups of women happily chatting away. Scones are on the menu; so don’t despair if you can’t see them in the cake cabinet. 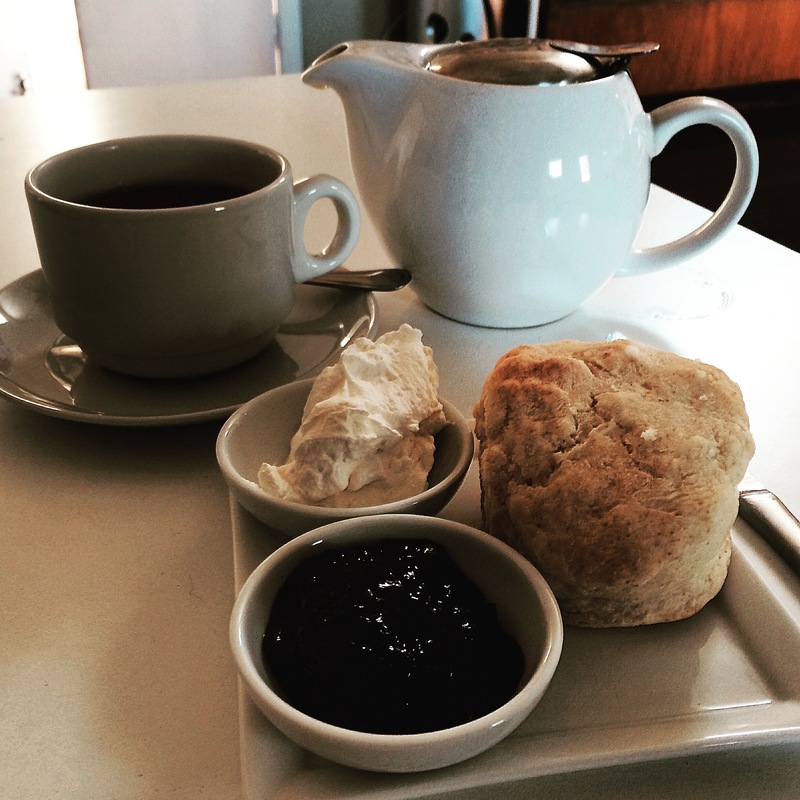 The small scones are baked on the premises and taste a bit chewy today, rather than light and fluffy. That’s not to say they won’t be different tomorrow. The jam is average in quality but what I like about it is it’s jelly like rather thin and syrupy. The cream is the best of all; thickly whipped. There’s indoor seating for when it heats up during the summer, but the courtyard is a lovely sun catcher and would be ideal for the cooler months. Overall: It doesn’t look feminine but it feels like a popular meeting place for ladies. The main reason for my visit to Peak Hill, halfway between Dubbo and Parkes on the Newell Highway, is the ‘Open Cut Mine Experience’. A couple of minutes from town, the five open cut mines and original gold diggings from the 1890s it became a tourist attraction after it closed down in 2002. The myriad walking tracks, and viewpoints over the mines are free, and tours can be organised for groups of 10 or more. 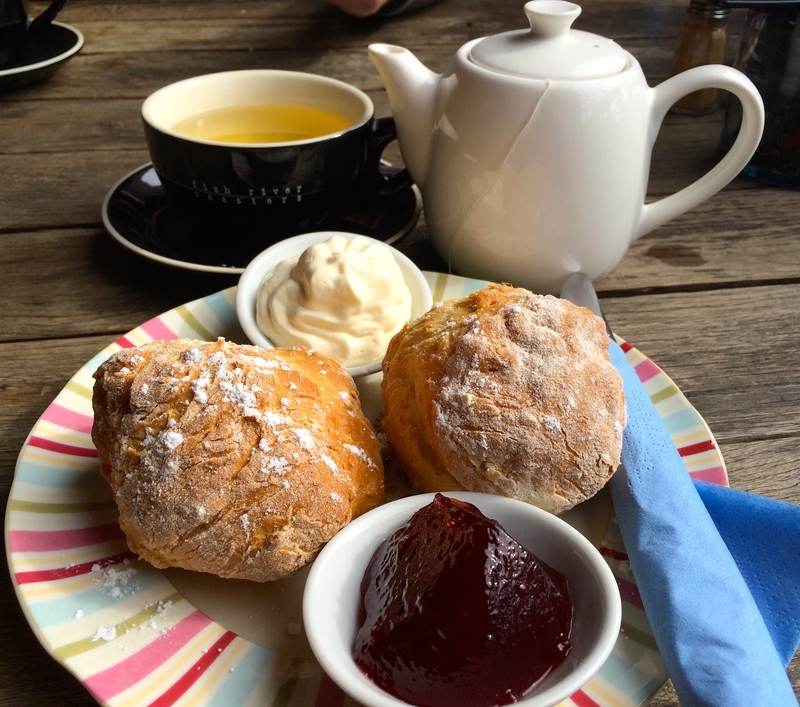 I missed the ‘big fish’ at the Big Fish Fossil Hut as I had more pressing things to do – like eat scones. The Temple Lion Patisserie is under the same business banner, and roof, as the Temple Lion Antiques and Collectibles. It’s in a magnificent heritage building that originally sold farm machinery, and later, where I sit munching scones, was a mechanics workshop – the sloped floor and doors are a giveaway. I settle in next to the fire for surprisingly good sultana scones that even though are a tad salty are fresh and edible. The jam is average but the cream is a let down as it’s super duper light and inconsequential to the overall taste of the Devonshire Tea. Tea: A selection of Liptons tea bags served in a good-sized pot. Overall: A one-stop antique, collectibles, lolly and cake shop under one heritage roof. About 15 years ago, The Dish, a movie recounting the Parkes telescopic radio’s role in relaying live television of man’s first steps on the moon during the 1969 Apollo 11 mission. The fictionalised storyline didn’t just do great things for the actors and the Australian movie industry but also inspired hordes of visitors to the Observatory’s doorstep. This is my second visit in the last 14 years, and the visitors centre has certainly changed, creating a better visitor experience. The café is one of the changes. With ground to ceiling glass, the views of the radio telescope are sensational and diners don’t have to take their eyes off the prize while they eat. Although I have to admit that I am a bit disappointed. Going to a café with high expectations is never good. The brochure says that the café has won several local tourism awards and reviews on Trip Advisor mention the blackberry jam. As pleasing on the eye as it is, the café looks very ordinary by day with a Streets ice-cream fridge along the wall, plastic high-chairs in the corner, and a pay and order at the counter system. Maybe at night and for events it is transformed? The scones have great potential, but on this Saturday morning they taste a bit stale and are fairly dry. They are tarted up with a sprinkle of icing sugar but they really could be better. It’s fig jam today rather than the anticipated blackberry, which is both an interesting and welcome choice. 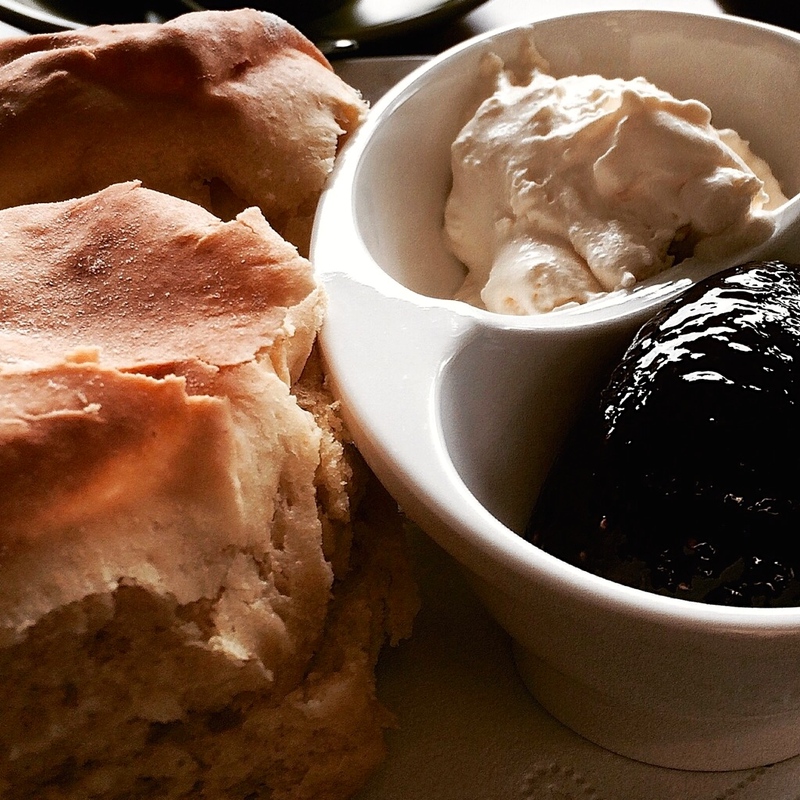 The cream is very light and airy and barely makes an impression on the scones. The Dish Cafe’s gourmet store occupies a few shelves in a corner of the café and is filled with relishes, jams, oils etc., sourced locally and branded for the café. Tea: A small variety of loose-leaf teas served in a small soulless teapot. Overall: After seeing the movie, a visit to The Dish is almost a rite of passage. Tucked away inside Aminya Nursery off the Newell Highway, The Next Grind Coffee and Gallery is quite a find. With bakers on site there are lots of goodies baked daily and when we arrive there are racks of pies straight out of the oven and yummy looking cakes. Ladies will enjoy the opportunity to pick up some gifts from the range of nic nacs or art on display, or there’s always the nursery outside. I want to try most of the cakes, but opt for the Devonshire Tea, which surprisingly ends up being pretty average. The scone arrives looking like a muffin and also tastes more muffin than scone. The jam is good enough and the cream is freshly whipped but quite light. Closed Mondays. Tea: Liptons tea bags served in a good-sized teapot. Overall: A chilled out cafe with a range of tempting goodies. National Trust’s Dundullimal Homestead on the outskirts of Dubbo is believed to be the oldest sophisticated slab house in Australia. Built sometime in the 1840s as the homestead for a 6,500-hectare station, the furnished house still retains much of its ambience. The wallpaper in the sitting room has been reproduced from an 1850 patent and there are enough audio interpretations if there isn’t a National Trust volunteer guide at hand to fill in the gaps. Wander the grounds through the renovated stables, blacksmith’s forge, coach room, sunken cool room, and stores. A small 1870s timber church from a nearby township now resides where the original church once stood, and no doubt makes Dundillimal Homestead the perfect property for a wedding. Take tea at The Shed Cafe that’s housed in the refurbished machinery shed, and set up as a cafe/function room. 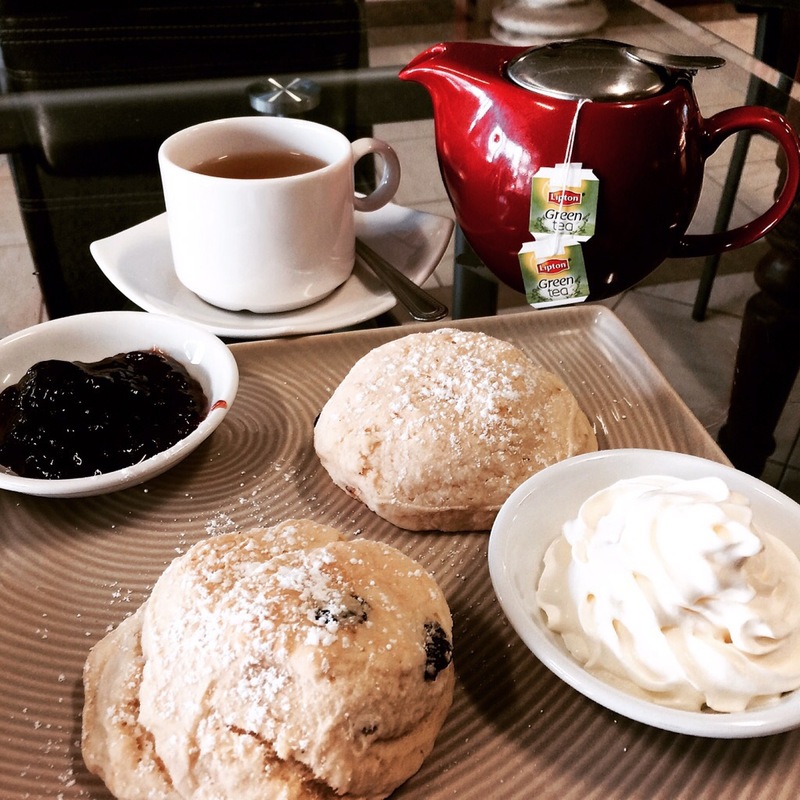 The scones remind me of CWA scones – small (the right size) and creamy. The strawberry jam is average but the thickly whipped cream is exactly what I’d expect to be served with my CWA-style scones. Open Tuesday to Saturday from 11am to 3pm. Admission to the property is $9.50. Tea: A range of loose-leaf teas served in a teapot. Overall: A superb historic property well worth the linger. There’s something special about finding remnants of a real 1950s milk bar; a marble top stainless steel bar, milkshakes served in stainless containers and touches here and there that scream original and eclectic. It’s something you wouldn’t expect in a small town on the Castlereagh Highway that sees mainly a transient traveller stopping to stretch their legs. The White Rose Cafe is quite a surprise. 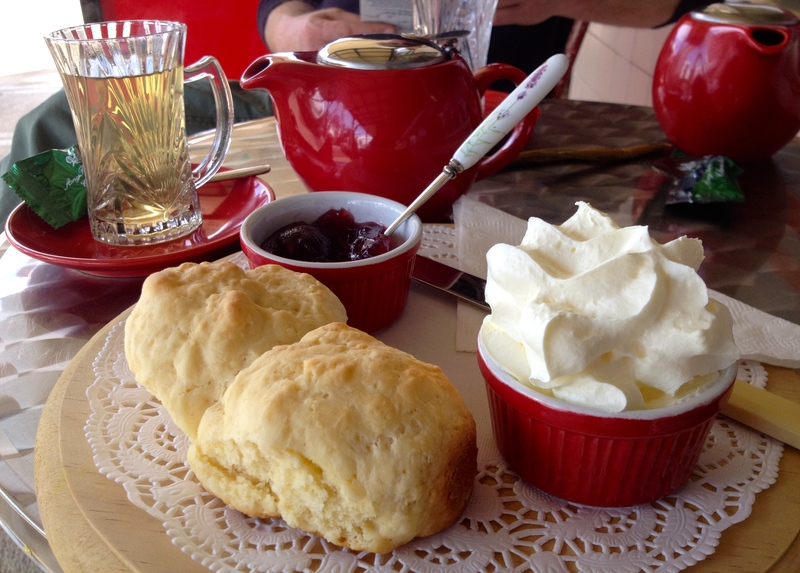 Not only does it have some original style but also sells a brilliant Devonshire Tea for a bargain price of $6. The tea is a bit too weak and the cream too light but the presentation is superb, arriving on a breadboard with a cute glass for the tea. The jam reminds me of my childhood and tastes just like IXL jam out of a can. The scones are creamy and fluffy – definitely homemade. 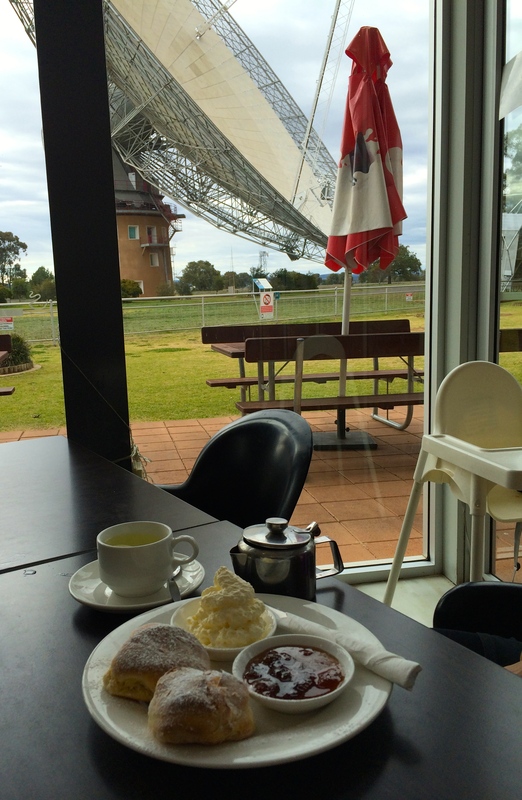 Dunnedoo is well and truly worth a stop for the scones. Tea: A small choice of loose-leaf teas served in a teapot. Overall: A cool 1950s style milk bar serving a value-for-money Devonshire Tea.